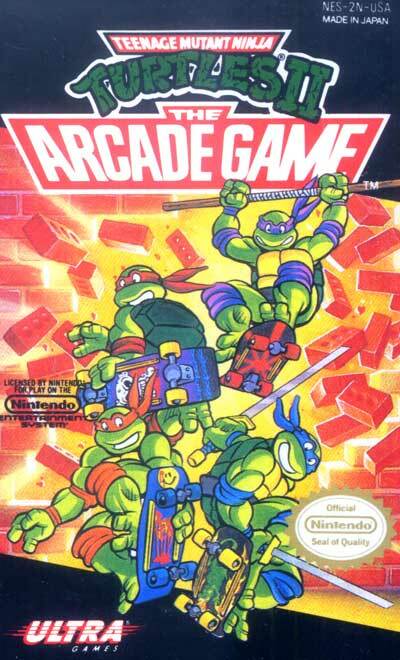 Teenage Mutant Ninja Turtles: The Arcade Game is an arcade game produced by Konami in 1989. It is a scrolling beat 'em up based on the 1987 Teenage Mutant Ninja Turtles animated series. It was ported to the NES and released in 1990. The player chooses from one of the four Ninja Turtles: Leonardo, Michelangelo, Donatello, and Raphael. After Shredder kidnaps the turtles' friend April O'Neil and their mentor Splinter, they must give chase, save their comrades, and defeat the evil Shredder. The NES version includes two new levels, the first part of Scene 3 and Scene 6), each with a new end boss: Tora and Shogun respectively (both characters created for the game). Most of the arcade version's stages were extended as well. The second part of Scene 3, the parking garage stage, replaces the arcade version's end battle with Bebop and Rocksteady with a battle against the mutated fly form of Baxter Stockman.